My inspirations are my 101-year-old grandmother and my adopted daughter. Grandma’s mantra was “Health is #1” and she was only hospitalized once in her entire life. She made such a strong impression on me that I switched careers from being a Chemist to a Nutritional Chef and Dr. Sears Certified Health Coach to spread the importance of good health. No matter how smart, rich or talented you are, if you don’t have good health, you won’t be able to share or enjoy it. I’m very passionate about bridging the gap between knowing you should be healthy and actually doing it. For 17 years, I’ve been working with employee wellness teams, schools, busy professionals, athletes, pregnant/nursing moms, children and seniors to promote good health and nutrition. I love to educate people, wherever they are in their wellness journey, on simple, effective ways to live healthier, happier lives. 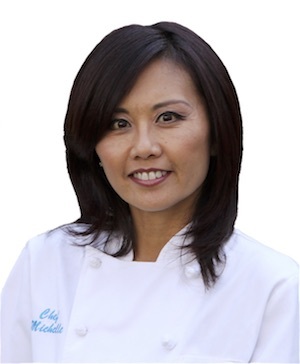 I am also an authorized vendor for Blue Shield of California and have enhanced numerous corporate wellness programs with healthy cooking seminars and culinary demonstrations at medium to Fortune 100 companies (See Testimonials and Partial Client List). Employees love the fun and engaging culinary demos and yummy samples! They provide inspiration, simplicity and practical tools to develop a sustainable healthy lifestyle. Thank you for your interest! I look forward to sharing life-changing tools and information with you, your family or your employees. Michelle received her Health Coach Certification from the Dr. Sears Wellness Institute, founded by world-renowned physician and author, Dr. William Sears.The Institute is a leader in science-based health and wellness education that focuses on the four pillars of health; Lifestyle, Exercise, Attitude and Nutrition (L.E.A.N.). A certification by the Dr. Sears Wellness Institute is obtained only after completing the extensive course work and meeting all requirements. Once certified, a Health Coach possess the knowledge, tools and resources to make a positive difference in the health of others.